The Queen's Theatre is a West End theatre located in Shaftesbury Avenue on the corner of Wardour Street in the City of Westminster. It opened on 8 October 1907 as a twin to the neighbouring Hicks Theatre (now the Gielgud Theatre) which opened ten months earlier. Both theatres were designed by W.G.R. Sprague. Some of the most popular recent productions at the theatre are The Hobbit, Mysteries, Umoja, The Rocky Horror Show, Les Miserables and many more. Piccadilly Circus is approximately 250m from the theatre. Charing Cross is approximately 550m from the theatre. The theatre is in the centre of London. It is advised to use public transport if possible. You can get bus 14, 19 or 38. You can use MasterPark at Poland Street and China Town. Also you can use NCP at Wardour Street, Newport Place, Denman Street and Lexington Street. 18 steps from the foyer up to the rear Dress Circle. 21 steps from the foyer down to the Stalls. 39 steps from the foyer to the Upper Circle (this area is quite steep). Entrance to the auditorium is through the fourth side EXIT door on Wardour Street - please ask a member of staff to open this for you. 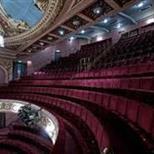 One 5cm step up to 2 spaces at C1 and C25 in the Dress Circle.Companions can sit in the same row. The Venue is suitable for scooters. 4 scooter and 6 wheelchair transfer seating available in rows C, D or E. All disabled information and bookings please call 0844 482 5137. There are infa-red systems available at the venue. Guide dogs are allowed inside the auditorium. Theatre Management can look after them if required. For bookings and information, please call 0844 482 5137.